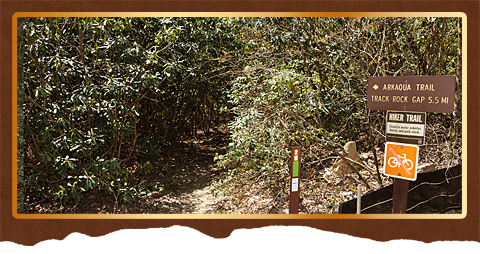 This 5.5-mile trail descends westward along a ridge top to the valley below and is either accessible from the back end of the summit parking area atop Brasstown Bald, or across the road from the Track Rock Archeological Area along Track Rock Road just off US 76 in the valley below. Hikers along the trail will pass through a northern hardwood forest while viewing scenic outbreaks through the trees, wildflowers and various herbs on their way to the Blue Bluff Overlook. Along the way hikers will pass Chimney Top Mountain and be able to view Rocky Knob to the south. The stress rating for the trail is moderate to strenuous and not recommend for casual hikers. For most hikers that choose to take on the trail, I personally recommend the descent from the Brasstown Bald mountaintop parking area to the Track Rock Valley below providing you have someone pick you up at the bottom of the trail or drop you off at the top of the trail, or have a parked vehicle awaiting you for your return trip. The GPS location to the trailhead on this App is at the top of Brasstown Bald parking area near the Visitors Center.